Join my Team and Get a Deal: Time is Limited! 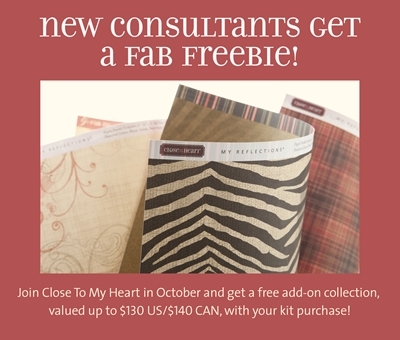 Have you ever considered becoming a Close To My Heart consultant? Now is the time, but that time is almost up. The special promotion, Add on for Free, is over October 31. Right now, when you sign up to join my team, you can choose an add-on pack (retail value of up to $140!) for free. You already get an amazing deal when you purchase the New Consultant kit, for just $99 and now you’ll get even more. But it’s over very soon. I’d love to have you join our team of consultants. I’m looking for people who are willing to step out, have fun, and learn new things. It will feel overwhelming at first, but I’m here to help you, answer your questions, and get you started off on the right foot. Maybe you’re not sure what’s all involved with this new job. Maybe you’re raring to go. Send me an email or call me and we’ll set up a time to chat.